Consumers may be feeling less-than-confident due to worsening economic conditions, but online retailers still have swagger in their step. Online sales for Kohl’s grew nearly 30% last quarter while in-store sales declined by 6.7%. Footlocker grew online sales by just over 7% while its in-store sales decreased by nearly 3%. Kohl’s and Footlocker are just two online retailers finding the interet to be one of the few bright spots in these tough economic times. According to a survey conducted by InternetRetailer.com, online retailers in general are quite bullish about their prospects this year. What to attribute such bullish sentiments to? Something that is sorely lacking in other parts of the internet economy – sane business practices. Online retailers are focused on profitability, and that means that they are watching what they spend and making investments that they believe will show up on the bottom line. As costs rise, online retailers are cutting back in certain areas to compensate and while I do expect them to find that they’re not immune to the ills of the economy at large, their practices will hold them in better stead. According to InternetRetailer.com, nearly 31% of online retailers surveyed will work to save on general and administrative expenses, 21.8% plan to spend less on advertising and marketing and 21.8% will reduce fulfillment expenditures. Less than 11% plan to cut back on technology. Only 15% of those surveyed had raised outside capital and the amounts were generally small. Two-thirds of the online retailers that raised capital reported raising less than $3mn. Even fewer online retailers plan to grow non-organically through mergers and acquisitions. Instead, many are focusing on squeezing more sales from existing customers – a smart move. The behaviour of online retailers highlights just how far the business of e-commerce has come. Having personally lived through the excesses of a Bubble 1.0 e-commerce startup, it’s quite clear that e-commerce has matured. Obviously, some of the excesses of Bubble 1.0 played a role in laying a foundation for the mature online retailing market that is seen today, but it’s worth noting that, for all of the “New Economy” hoopla that was bandied about in the late 1990s, it’s time-tested business practices that are ensuring that online retailers thrive in a challenging economic environment. It’s also worth noting that Internet Retailer Top 500 is, in large part, led by offline retailers who expanded their operations to the internet. 56% of the Internet Retailer Top 500 is made up of brick-and-mortar retail chains, catalog and direct marketing firms and manufacturers. The retail chains alone accounted for nearly 40% of all online sales generated by Top 500 members. Based on the data from InternetRetailer.com, the scores currently are Establishment 1 – Upstarts 0, Real Economy 1 – New Economy 0. Will the scores following the aftermath of Bubble 2.0 look anything like the scores following the aftermath of Bubble 1.0? Time will tell. Debate New Media versus Old Media all you want – I’m putting all of my money on the Real Economy. Online auction giant eBay is introducing some much needed changes to its search functions, making it easier for users to find what they want and filter out what they don’t. 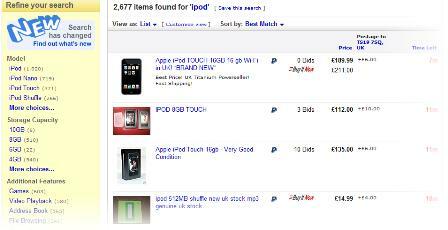 The changes will go live on the UK site in the next month but are already available to try out on eBay Playground.